Vladislav Tretiak of the USSR is the only male athlete to have won three gold medals and one silver in ice hockey. The Soviet Union had won the gold medal in five of the six previous Winter Olympic Games, and were the favorites to win once more in Lake Placid. The team consisted primarily of professional players with significant experience in international play. By contrast, the United States' team—led by head coach Herb Brooks—consisted exclusively of amateur players, and was the youngest team in the tournament and in U.S. national team history. In the group stage, both the Soviet and U.S. teams were unbeaten; the U.S. achieved several notable results, including a 2–2 draw against Sweden, and a 7–3 upset victory over second-place favorites Czechoslovakia. For the first game in the medal round, the United States played the Soviets. 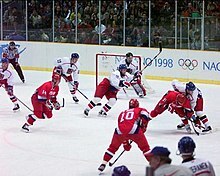 Finishing the first period tied at 2–2, and the Soviets leading 3–2 following the second, the U.S. team scored two more goals to take their first lead during the third and final period, winning the game 4–3. Following the game, the U.S. went on to clinch the gold medal by beating Finland in the final. Likewise, the Soviet Union took the silver medal by beating Sweden. The victory became one of the most iconic moments of the Games and in U.S. sports. Equally well-known was the television call of the final seconds of the game by Al Michaels for ABC, in which he declared: "Do you believe in miracles?! YES!" In 1999, Sports Illustrated named the "Miracle on Ice" the top sports moment of the 20th century. As part of its centennial celebration in 2008, the International Ice Hockey Federation (IIHF) named the "Miracle on Ice" as the best international ice hockey story of the past 100 years. Allegations have surfaced of Sweden throwing a game against Slovakia so the Swedes would face Switzerland instead of Canada or the Czech Republic. Shortly before the game, Sweden coach Bengt-Åke Gustafsson was reported to have publicly contemplated tanking in order to avoid those teams, saying about Canada and the Czechs, "One is cholera, the other the plague." During the game itself, one reportedly suspect sequence came when Sweden had an extended five-on-three powerplay with five NHL stars on the ice—Peter Forsberg, Mats Sundin, Daniel Alfredsson, Nicklas Lidström and Fredrik Modin—and failed to put a shot on net. Sports Illustrated writer Michael Farber would say about this particular powerplay, "If the Swedes had passed the puck any more, their next opponent would have been the Washington Generals." "[They] were even afraid to shoot! ", Russian coach Vladimir Krikunov said. As part of a subsequent interview about the championship over five years later, Forsberg was interpreted to insinuate that Sweden lost their preliminary round game against Slovakia on purpose, so as to draw Switzerland as their quarterfinal opponent, rather than Canada or the Czech Republic. Swedish forward Henrik Sedin, who played alongside Forsberg on the 2006 team denied the notion while adding that Forsberg's comments in the interview were misconstrued. In 2006, Sweden defeated the US in a shootout in the semifinals. In the medal games, Canada defeated Sweden 4–1 to claim its second consecutive gold medal, while the Americans beat Finland 4–0 to win the bronze. In 1992, National Basketball Association (NBA) players participated in the 1992 Summer Olympics. NHL commissioner Gary Bettman (an NBA executive in 1992) commented that the "[NBA]'s worldwide awareness grew dramatically". He hoped that NHL participation would "get exposure like the world has never seen for hockey". The typical NBA season is held in the winter and spring, so the Summer Olympics do not conflict with the regular season schedule. Bettman "floated a concept of moving hockey to the Summer Games", but this was rejected because of the Olympic Charter. In March 1995, Bettman, René Fasel, IOC president Juan Antonio Samaranch and NHLPA executive director Bob Goodenow met in Geneva, Switzerland. They reached an agreement that allowed NHL players to participate in the Olympics, starting with the 1998 Games in Nagano, Japan. The deal was officially announced by the NHL on 2 October 1995. Bettman said: "We're doing this to build the game of hockey, pure and simple, we think whatever benefits are recouped, it will end up making this game bigger, stronger and healthier." Although in the following months the president of the IIHF René Fasel tried to convince NHL to change its decision, in September he stated that there was no chance for participation of NHL players in the Pyeongchang olympic tournament. "I can say that this is now gone. We can tick that off the list. We will have to look ahead to China and the Beijing 2022 winter Games because there is an interest of the league and we have noted that. But logistically it is practically impossible for Pyeongchang. That train has left the station", he said. Some NHL players expressed their discontent with league's decision to skip the Olympics. Alexander Ovechkin, captain of the Washington Capitals: "The Olympics are in my blood and everybody knows how much I love my country", adding that "he would compete with Russia if he were the only NHL player to travel to South Korea". “It’s brutal, [...] I don’t think there’s any reason we shouldn’t be going”, said Justin Faulk, 2014 Olympian and alternate captain for the Carolina Hurricanes. Eventually, the NHL players were ordered to follow the league's decision and ultimately stayed in their clubs during the 2018 Olympics. During a 2014 men's ice hockey tournament round-robin game between USA and Russia, a Russian goal scored late in the third period, which would have given the team a 3-2 lead, was disallowed after referees ruled that the net was moved when the goal was scored. The decision resulted in the score remaining 2-2. USA went on to win the game in a shootout, which resulted in Russia playing a playoff qualification game while USA received a bye to the quarterfinals. The decision was criticized by many Russian politicians, TV hosts and commentators. Following the game, protesters led by the Kremlin party's youth group held a demonstration in front of the U.S. Embassy in Moscow to protest the decision. In response to the controversy, Konstantin Komissarov, the referee supervisor of International Ice Hockey Federation, officially confirmed that the decision by the referee was correct, citing the appropriate use of video review in assessing the play. The IIHF follows the World Anti-Doping Agency's (WADA) regulations on performance-enhancing drugs. The IIHF maintains a Registered Testing Pool, a list of top players who are subjected to random in-competition and out-of-competition drug tests. According to the WADA, a positive in-competition test results in disqualification of the player and a suspension that varies based on the number of offences. When a player tests positive, the rest of their team is subjected to testing; another positive test can result in a disqualification of the entire team. West Germany 1972 Ephedrine Six month suspension from IIHF The first Winter Olympics athlete to test positive for a banned substance, Schloder was banned from the rest of the Games but his team was allowed to continue playing. Czechoslovakia 1976 Codeine None Team doctor Otto Trefny, who prescribed Pospíšil the drug as treatment for the flu, received a lifetime ban. The team was forced to forfeit a game against Poland but went on to win the silver medal, which Pospíšil also received. Poland 1988 Testosterone 18-month suspension from IIHF The Polish team was allowed to continue playing without Morawiecki, but were stripped of two points they earned in a victory over France. Sweden 2002 Acetazolamide None Öhlund had inadvertently ingested the substance in medication he was taking after undergoing eye surgery and was not suspended. Belarus 2002 19-Norandrosterone Retroactively disqualified Pankov was also forced to return his Olympic diploma. Evgeni Lositski, the team doctor, was banned from the following two Olympics. Slovakia 2010 Pseudoephedrine Issued a reprimand Višňovský took Advil Cold & Sinus to combat a cold, unaware that it contained a WADA prohibited substance. He had consulted with the Slovak national team doctor and declared that he was taking the medication. Levels on samples two and three were well below WADA limits. Latvia 2014 Methylhexaneamine (dimethylpentylamine) Disqualified from quarter-final game Pavlovs was disqualified from the Canada-Latvia quarter-final game and was forced to return his Olympic diploma. According to Pavlovs, he had "been taking food supplements upon the recommendation of the doctor of his club team and that he did not understand how this substance entered his body." Sweden 2014 Pseudoephedrine Pulled from gold medal game Bäckström was taking an over-the-counter medication to treat a sinus condition. He consulted with the team doctor and was informed that there would not be a problem. Bäckström's medal was initially withheld but was returned the following month. The IOC determined that "there was no indication of any intent of the athlete to improve his performance by taking a prohibited substance." Latvia 2014 Anabolic androgenic steroid Disqualified from quarter-final game Freibergs was disqualified from the Canada-Latvia quarter-final game and was forced to return his Olympic diploma. ^ Roberts, Selena (9 February 2002). "Olympics: Opening ceremony; Games Begin". The New York Times. Retrieved 2 March 2009. ^ "The 20th Century Awards: Sports Illustrated honors world's greatest athletes". Sports Illustrated. December 3, 1999. Retrieved June 11, 2011. ^ "Top Story of the Century". International Ice Hockey Federation. Retrieved April 4, 2010. ^ a b Farber, Michael (March 6, 2006). "Swede Success". Sports Illustrated. Retrieved April 10, 2015. ^ "Report: Peter Forsberg Says Sweden Threw Game During 2006 Winter Olympics". NESN. 19 December 2011. Retrieved 26 March 2018. ^ "Forsberg shocker: admits Sweden may have tanked game in 2006 Olympics". Denver Post. 18 December 2011. Retrieved 26 March 2018. ^ Yi-Wyn Yen (17 February 2006). "1". Sports Illustrated. Retrieved 1 March 2009. ^ ESPN (21 February 2014). "Russian hockey fans protest disallowed goal in front of the U.S. Embassy". espn.go.com/. CBC News. Archived from the original on 2014-02-20. Retrieved 21 February 2014. ^ a b "IOC sanctions 11 Russian athletes as part of Oswald Commission findings". International Olympic Committee. 22 December 2017. Retrieved 22 December 2017. Kennedy Jr., John F. (2004). "Innsbruck 1976". In Findling, John E.; Pelle, Kimberly, D. Encyclopedia of the modern Olympic movement (illustrated, revised ed.). Greenwood Publishing Group. ISBN 0-313-32278-3. Morales, Yves (2004). "Pre-Olympic winter games". In Findling, John E.; Pelle, Kimberly, D. Encyclopedia of the modern Olympic movement (illustrated, revised ed.). Greenwood Publishing Group. ISBN 0-313-32278-3.